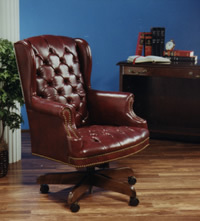 Wood, swivel, tilt, and diamond tufted simulated leather upholstery seat and back. 19 1/2” between arms x 20 1/2” deep x 17 1/2” to 23 1/2’ high, overall height 41” - 47”. Designed to meet federal specifications 191-5041, 191-5100, 191-5304, CS-273-65 and California flammability regulation 117-75SEC. Brass nail trim, hardwood frame, mechanical height adjustment, five -star base with dual wheel casters. Customer shall specify stain: Mahogany (dark w/ red tint), Walnut (dark), Fruitwood (medium), & Natural Oak (light). Please see Fabric Samples page for choices.